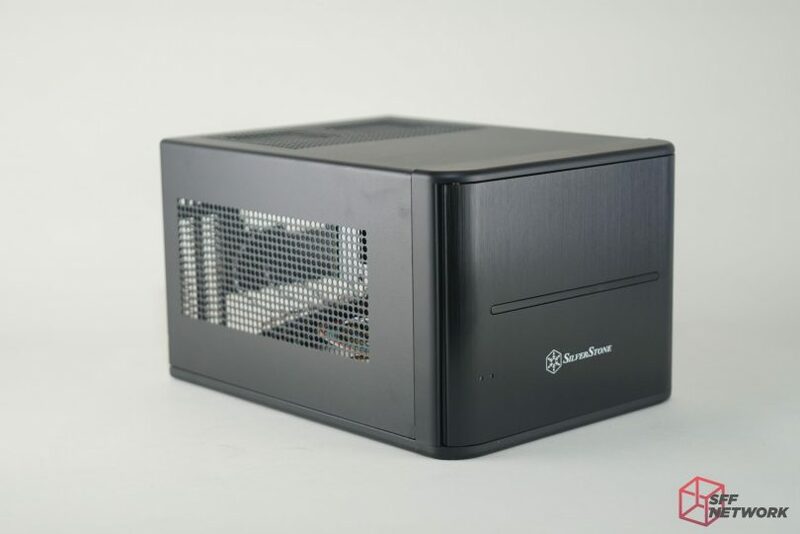 We would like to thank SilverStone for providing us with review sample of their CS280 8-Bay 2.5″ NAS chassis. Without their generosity, this case review would not be possible. 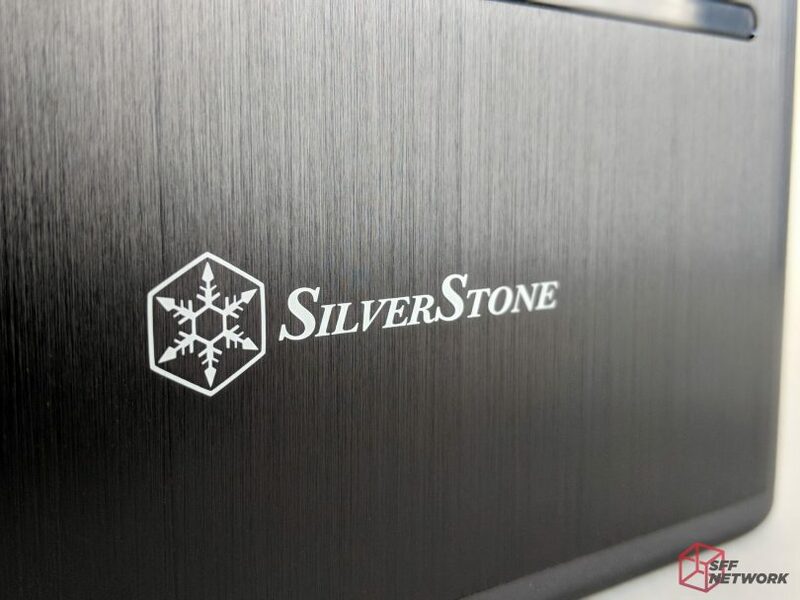 At CES 2018, Silverstone had a large number of 40 liter+ cases on display (which we chose not to cover). Unfortunately for us, the ITX market was largely ignored at their suite. 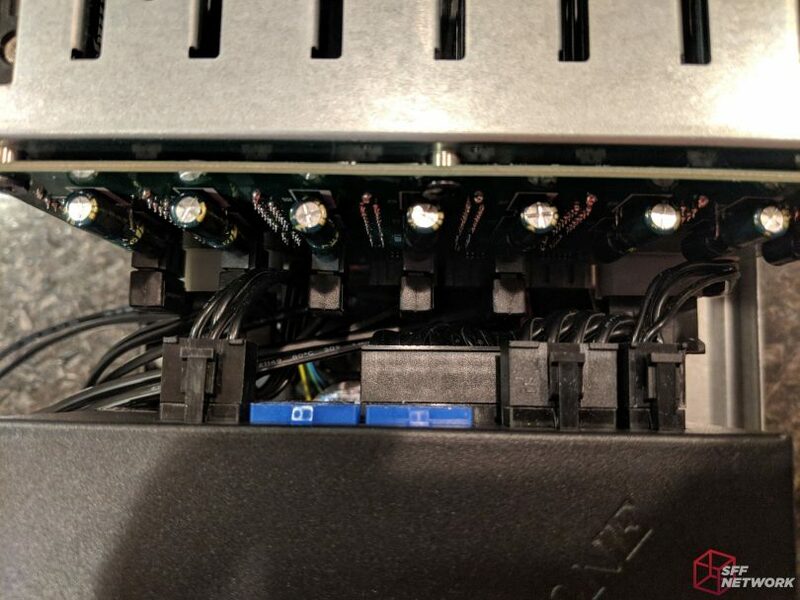 Save for a certain power-supply that we’re pretty eager to get our hands on, there wasn’t much for us to cover …although there are rumors that we may see something special at Computex 2018. What we didn’t see however, was Silverstone’s CS280 – and for a good reason. It’s a niche case that was released back in 2016 but didn’t get much coverage. What is it? 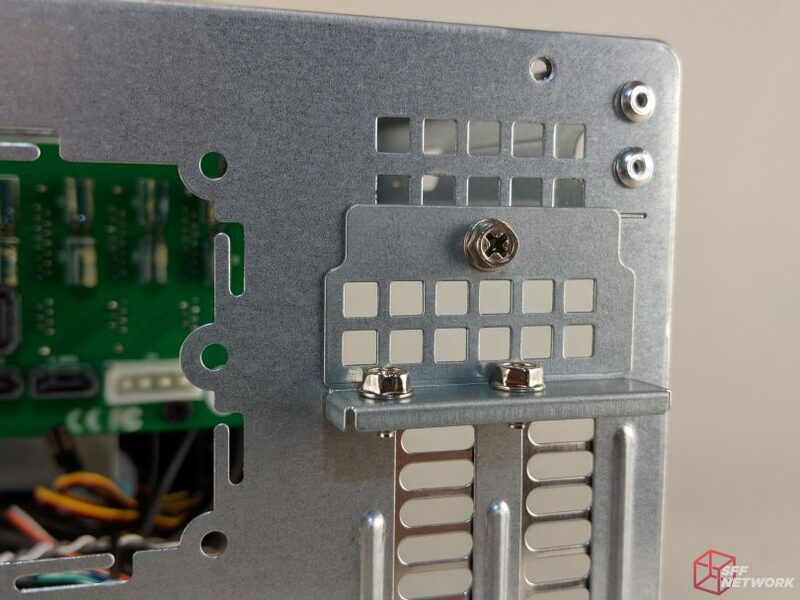 Well, it’s an ITX/SFX based NAS chassis, perfect for the Plex/Kodi/Freenas HTPC users among us… or is it? 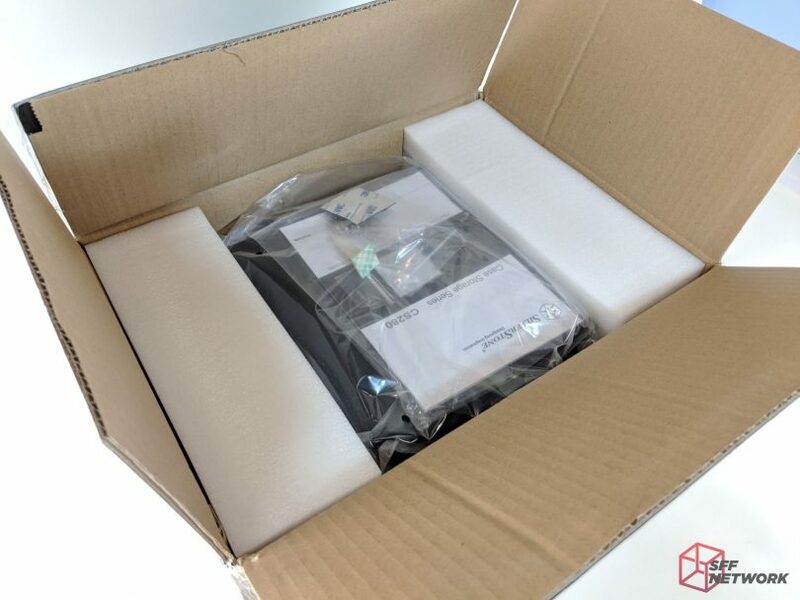 Here we can see Silverstone’s signature packaging. The chassis was well protected inside two sheets of high-density foam. The cardboard box felt robust enough to survive the journey and it held up really well. Included is a CS280 manual on high quality paper stock. 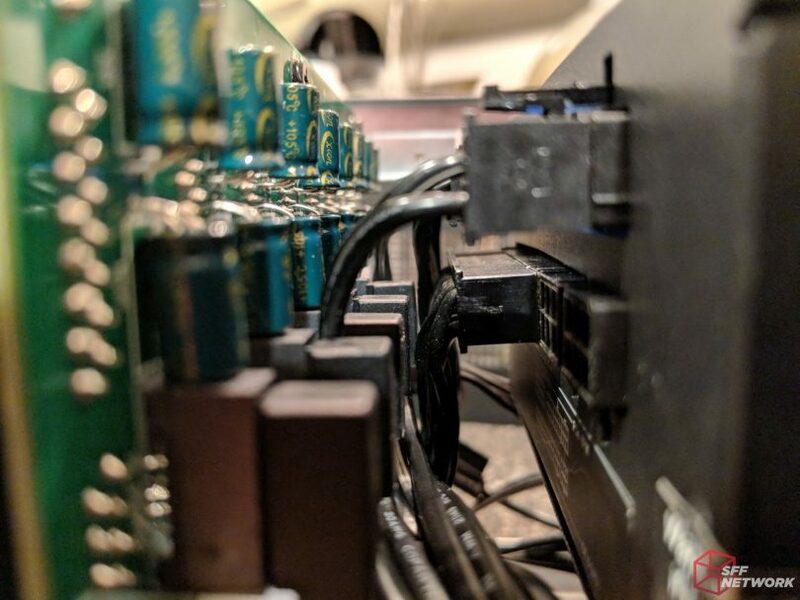 It also includes four vibration dampening feet, a bag of screws for mounting the 2.5″ HDDs into the hot-swap trays, a cable-organizer backed with double-sided tape, and a matching set of camlock keys to help prevent HDD thievery! 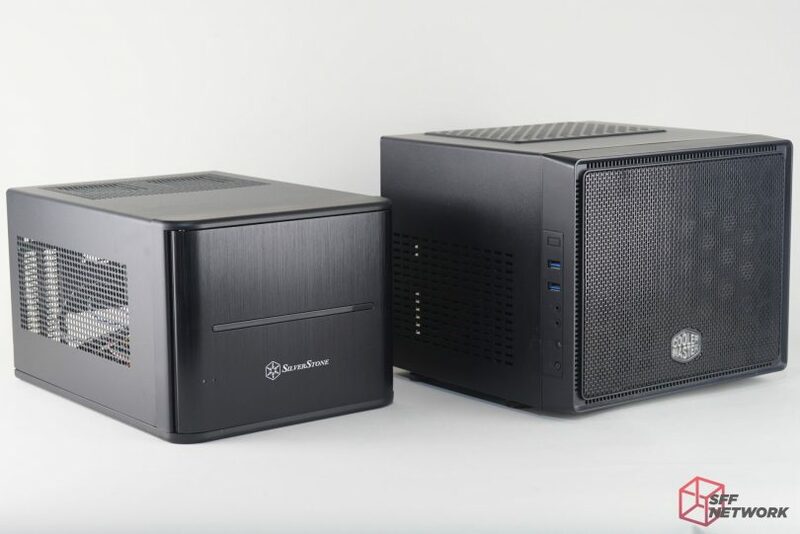 At this point, some of our eagle-eyed viewers might recognize that the Silverstone CS280 is using the exact same platform as the Silverstone SG05/SG13. While the design might be tried and true, it does prove to be problematic a little later into the review. The brushed aluminum front with the silk screened logo looks fantastic. The brushing is very smooth and the logo is extremely crisp. Sitting next to the Silverstone CS280 is my ugly betty, the Cooler Master Elite 110. 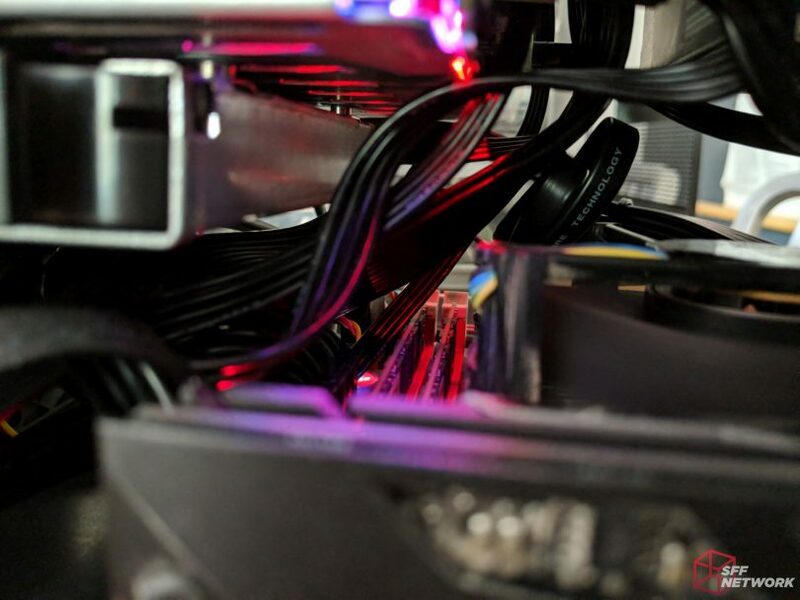 It’s used as a Plex transcoding server and with an MSI GTX 760 ITX GPU and it doubles as a light gaming rig when guests come over for the occasional LAN party. 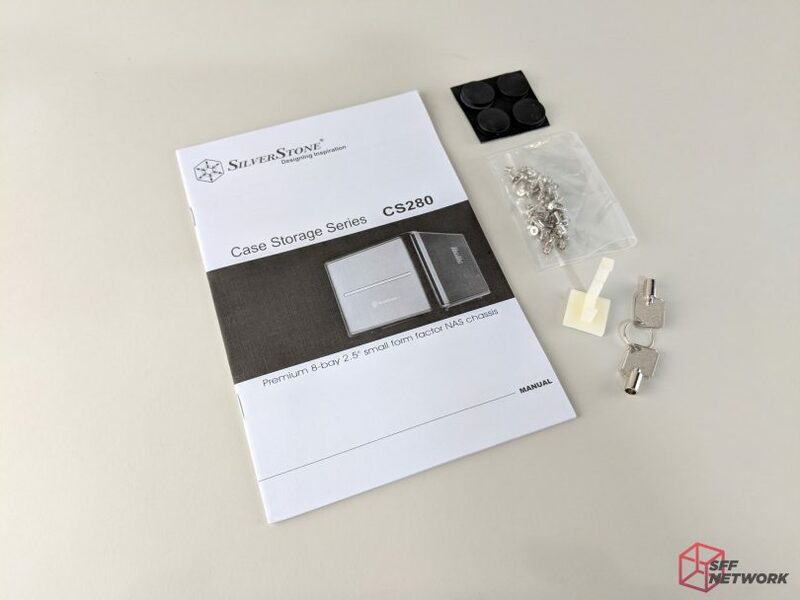 As a NAS user myself (QNAP) the thought of replacing my HTPC+QNAP hardware with something inside the CS280, is an incredibly enticing proposition. 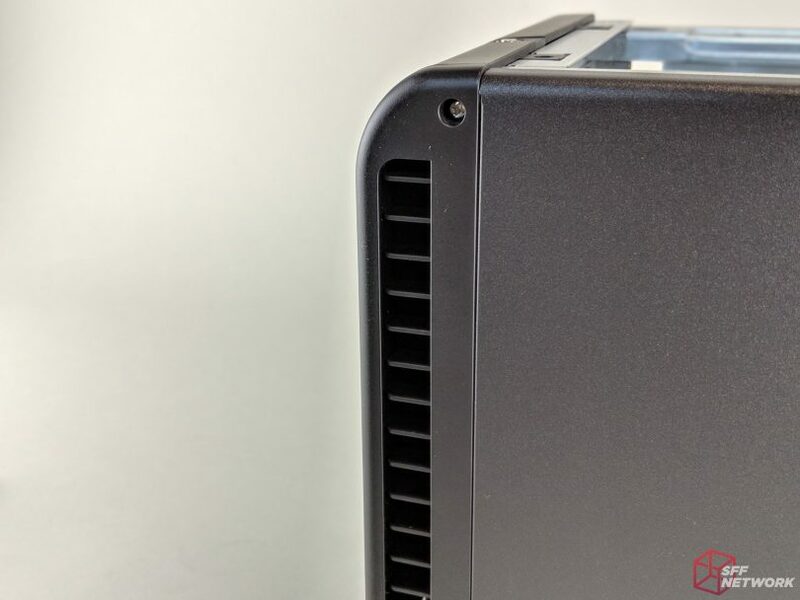 As you can see from the pictures above, the Silverstone CS280 is a much smaller case thanks to the use of an SFX PSU and lack of 3.5″ HDD support – good! 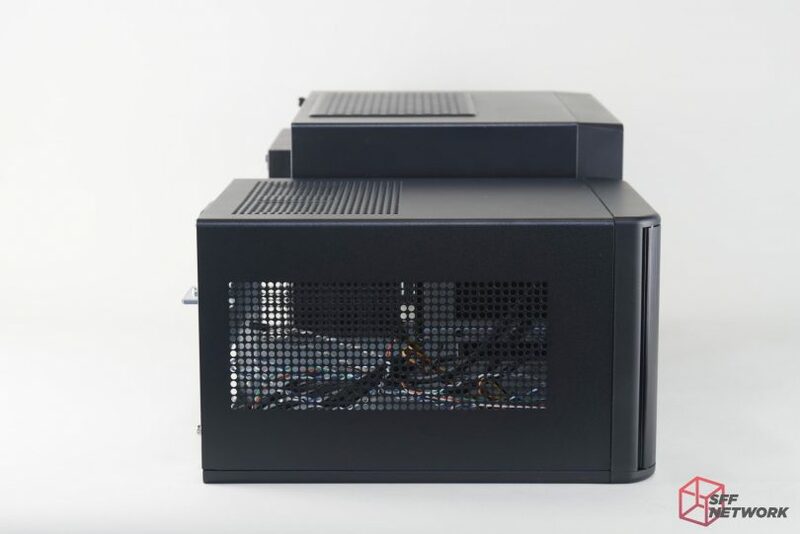 The design of the case is largely unchanged with a well fitted hot-swap bay mounted to the front of the chassis as seen through the rear the case. 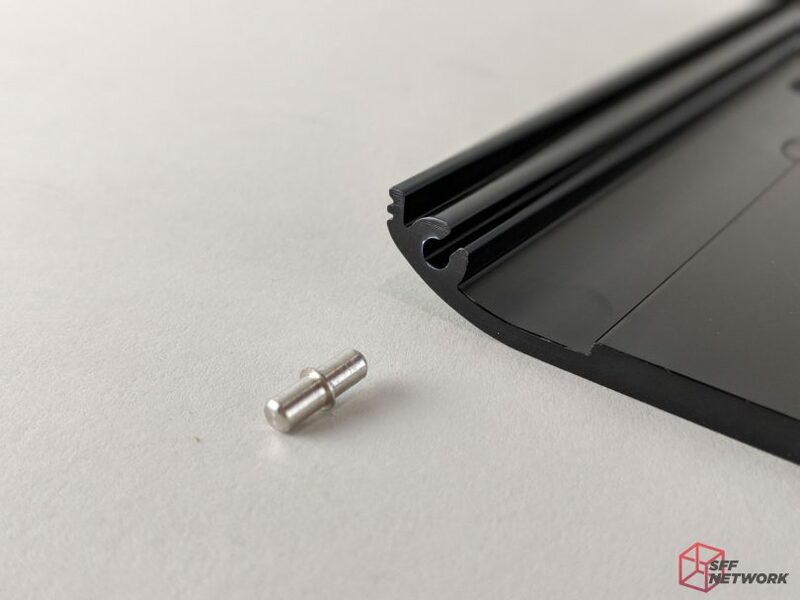 The camlock to prevent the front door from opening is flush-mounted into the right side of the chassis. The front door doesn’t offer enough grip to worry about you, or anyone else for that matter, breaking it on accident/purpose. Here you can see how the front door swings open and to the right (your left). 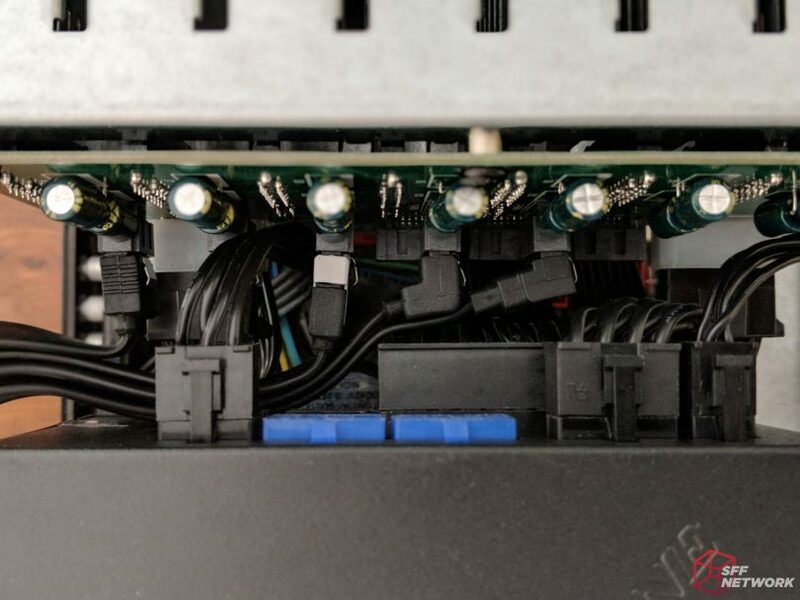 With the door open, we can see the 8x 2.5″ hot-swap bays, the front i/o, and a removable dust filter for the 2x 80mm fans. 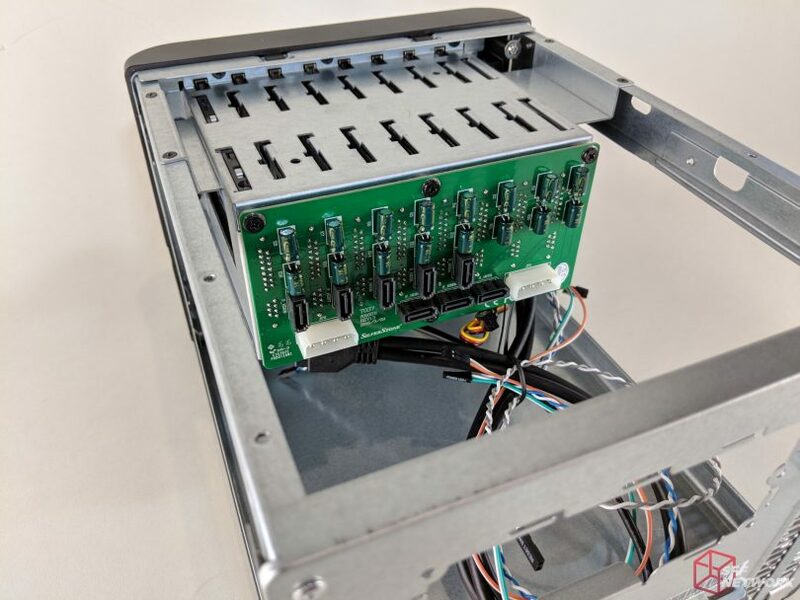 Each hot-swap bay also has it’s own camlock to lock-down only the bays you’re using. The 2x 80mm fans are located just in-front of the 9th(9th!) 2.5″ drive mount. 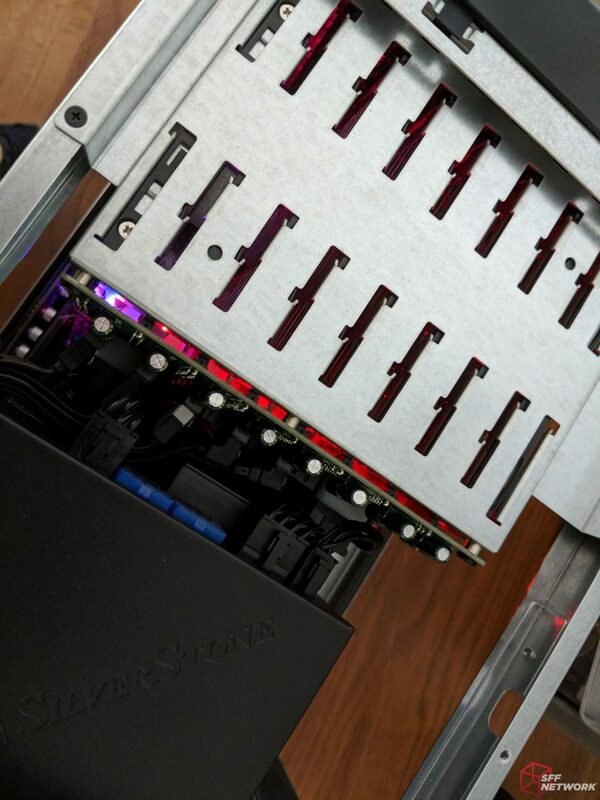 Silverstone appears to have chosen a custom Yrway A8015L axial fan that supports up to 0.28AMPs. I couldn’t find the exact figures for this fan but if the slightly lesser model is any indication, this is a ball bearing fan and a not sleeve bearing fan. For anyone curious, that’s good news! The front i/o consists of 2x USB 3.0 ports as well as a headphone and mic jack. Please don’t forget to remove your thumb drive before closing the door! Removal of the front cover (should you ever need to replace the 2x 80mm fans) requires that a total of 13 screws be removed. This is a terrific deterrent to would-be HDD thieves if using the camlocks just isn’t enough security. – 4 screws on the left front (2 outside, 2 inside). – 4 screws on the right front (2 outside, 2 inside). – 2 on the bottom of the front plastic faceplate. – 3 on the bottom of the chassis. A small detail, but never the less something I can appreciate -the simple design of the the door hinge. 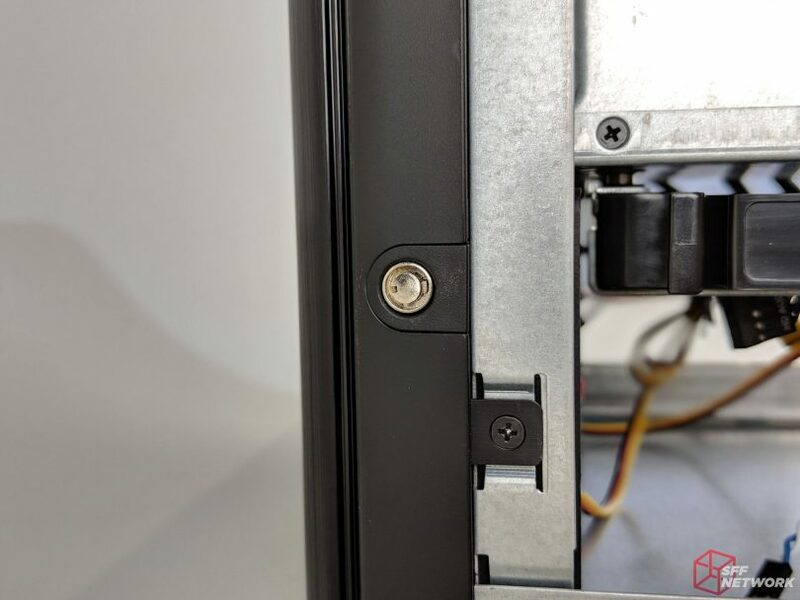 If ever the metal-on-metal starts to become a squeaky nuisance, an issue that plagues a my old Lian-Li cases, it’s nice to know that this hinge can be lubricated. The underside of the door has a large vent to allow for fresh airflow into the case. 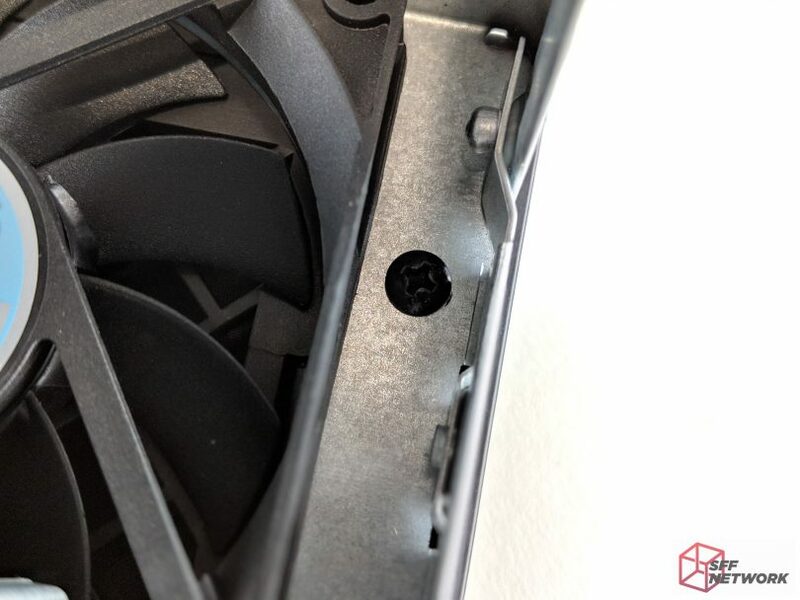 However, if you pay close attention to the design, you will notice that the airflow goes directly to 80mm fans, which push cold air directly to the internal components. While most of us wouldn’t frown at the idea, this is a NAS case and that’s not going to help where it matters the most. 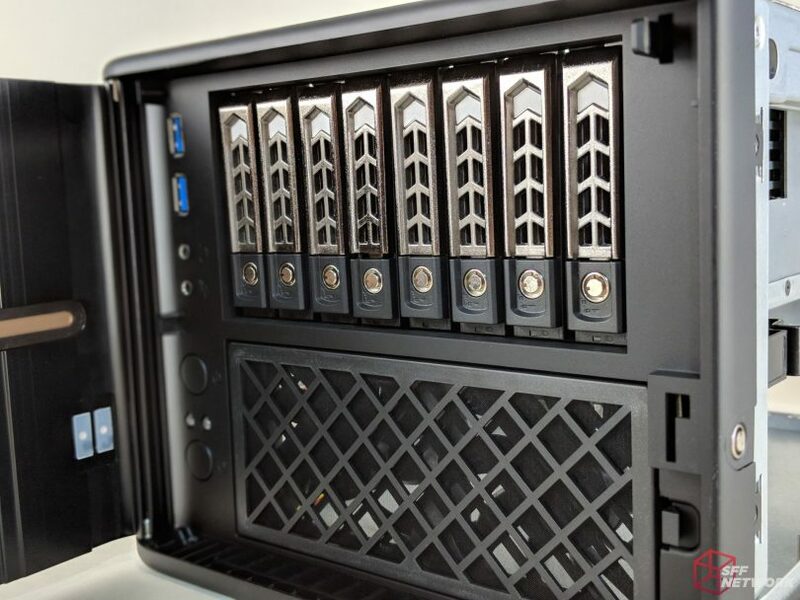 This means that should you decide to load the case up with 2.5″ mechanical HDDs, they are going to run hot, especially drives 4+5 and will likely lead to premature HDD failures. This is non-issue if you decide to go 100% SDD, which could prove quite costly given the current cost of NAND. Here is the Silverstone CS280 with the faceplate removed. If the use of all 8 bays is desired, be sure to pickup an ITX motherboard that has 8+ SATA 3.0 slots -they do exist! 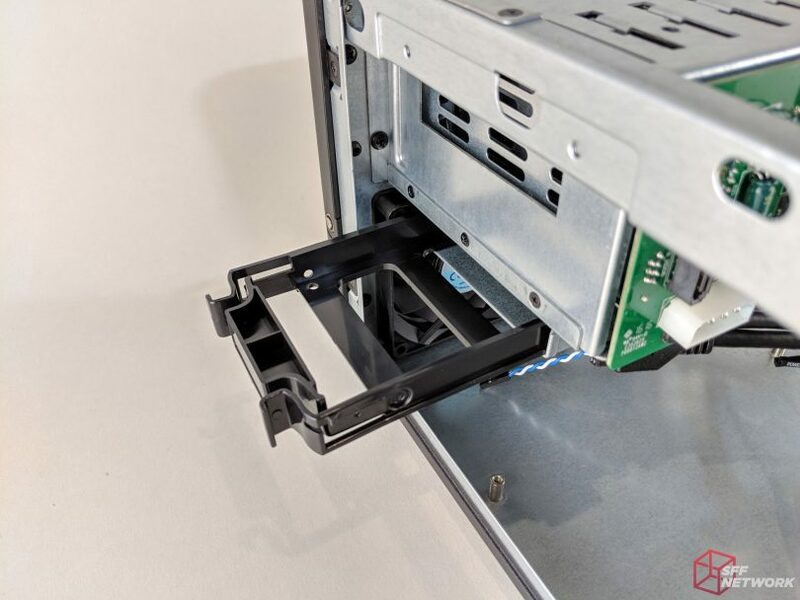 The 9th 2.5″ HDD bay, ideal for the OS drive, can be quickly removed from the underside of the hot-swap bay via a little plastic tray. 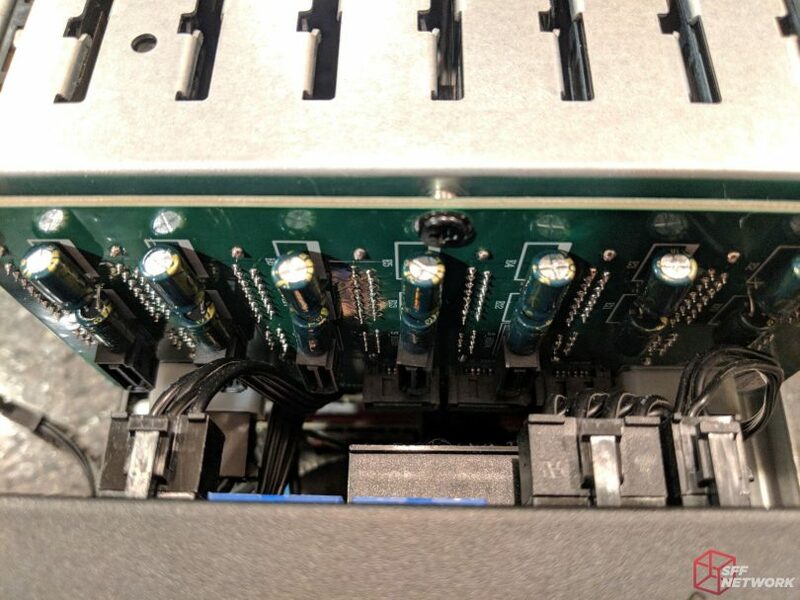 The ITX-sized GPU (6.7″/170.18mm x 4.7″/119.38mm) wouldn’t fit into the PCIe slot due to the positioning of the hot-swap bay. While the case advertises that it supports a card up to 8.66″ (220mm) in length, it also needs to sit lower than 2.39″ (60.75mm) to slip under the bay. I personally felt like this was a missed opportunity to a case that I was genuinely excited to work with. Should you desire a little more horsepower for 4k transcoding, emulation, or the occasional gaming session, this is no longer a possibility. The sad part is, this would have been non-issue if the bay was moved further over to the left. 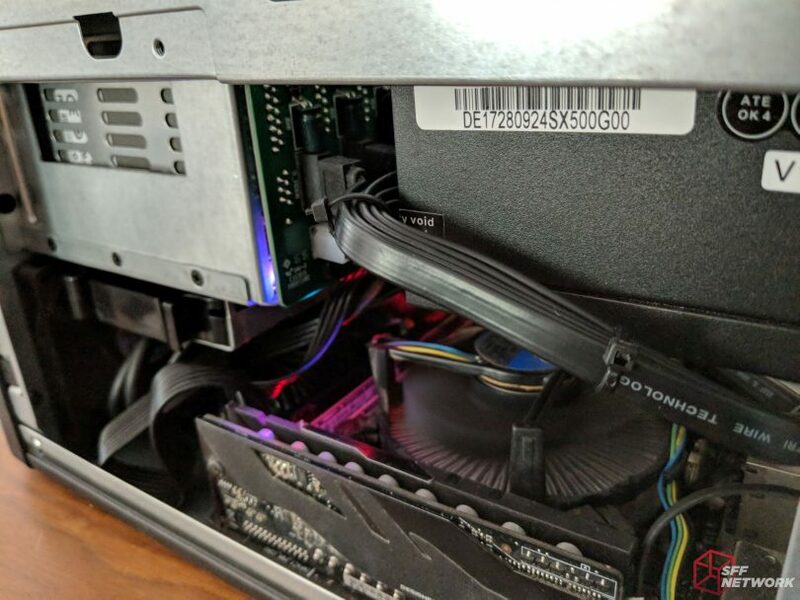 Because the SG05 supports a GPU in this same exact position, the case has the “extra room” for the card to run (both vertically and horizontally). Unfortunately, this is just wasted space in the CS280. Had they not reused the SG05 chassis, this case should have been made much smaller. 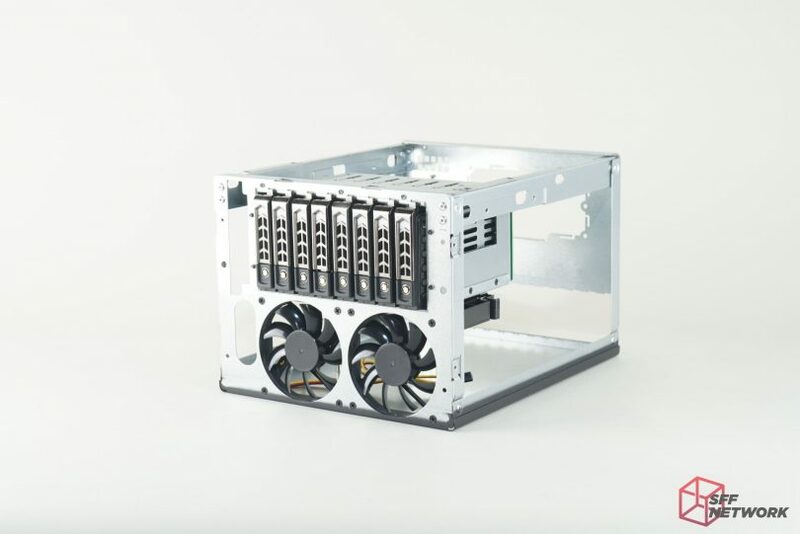 Without supporting a dedicated GPU, I guess this case could work for APU fans that are looking for a half-decent NAS chassis to stuff a 2200G or 2400G into. 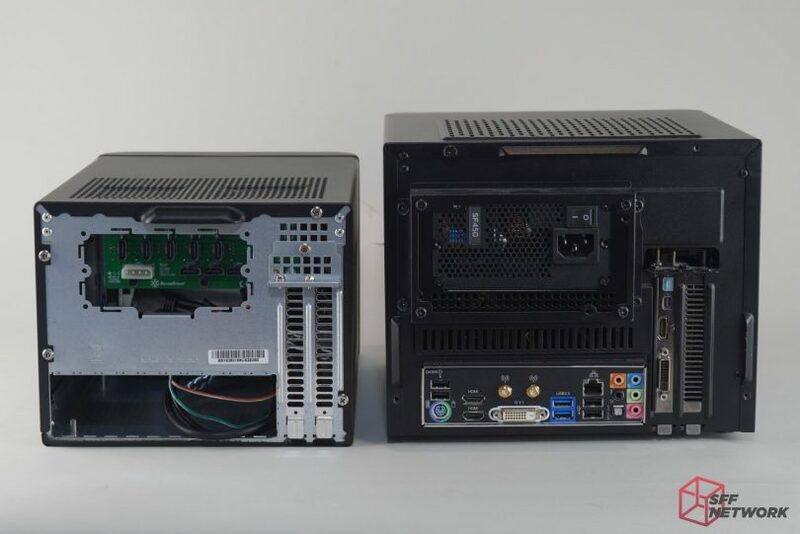 Even then, if the case was specifically designed for the use of an APU, it could have been even smaller. 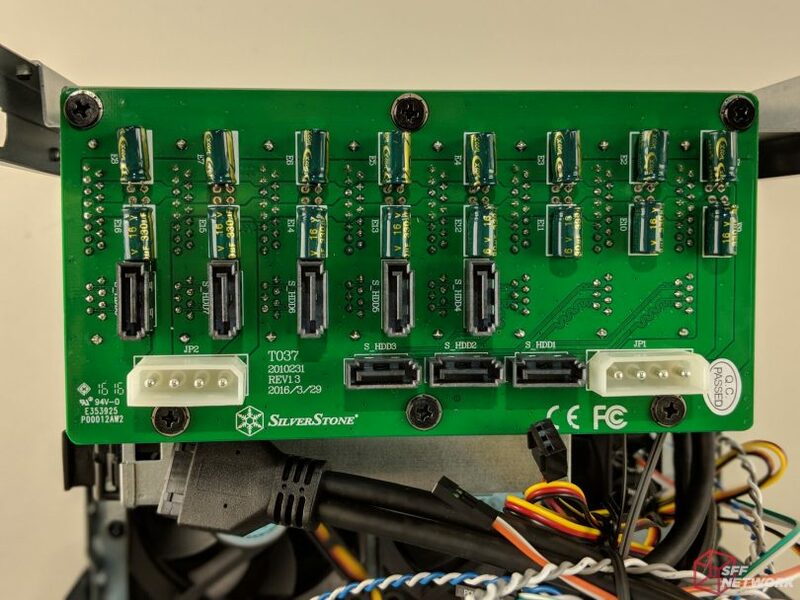 With the use of Silverstone’s SX500-G SFX PSU (reviewed here), the installation of 5x 2.5″ HDDs wasn’t any easier. Had I used Silverstone’s low-profile CP11 SATA cables, this job would have been a lot more friendly. Another thing worth noting: Taller memory modules will only make the job more difficult. If you decide to get this case, I highly recommend getting LP-DDR3 (as pictured) or standard height DDR4 sticks. It’s a very tight space to work with so the more room you have, the better. Each bay has LED indicators to let you know which ones have been occupied. This is also visible from the front the chassis though a little clear window -helpful if ever you have a drive failure. Anyway, to keep a long story short, our representative at SilverStone was willing to open dialogue about this chassis and send over some parts to improve the build. It set our original review release back by almost a month after dealing with some UPS postage drama, but in the end I feel that it was worth the wait. This is the SilverStone CP11 sata cable (surprise, it’s black!). It’s a low-profile SATA cable and I’m hopeful that installing a few of these will clean things up a bit. 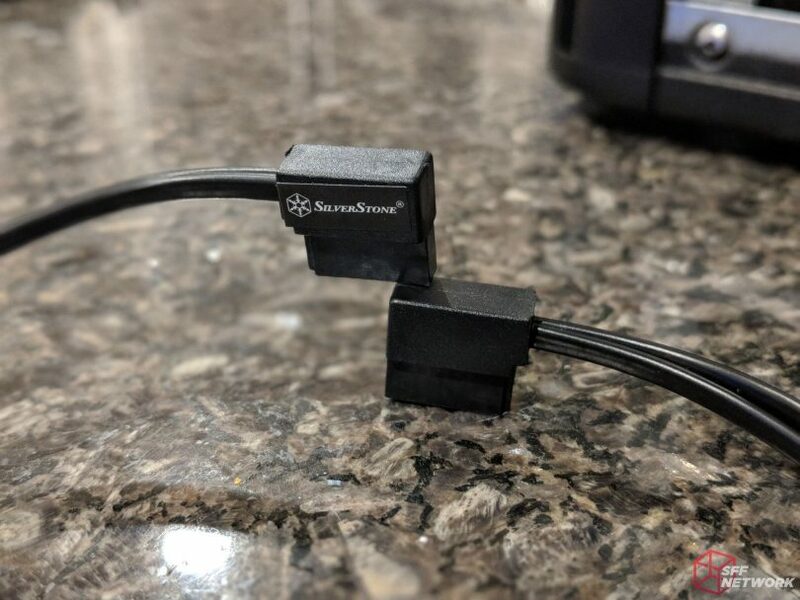 The SilverStone stickers detract from the visual quality of these cables but they aren’t the slightest bit sticky and are incredibly easy to remove for those those seeking a more clean aesthetic. This is all the space that we have for installing the SATA cables so it’s pretty tricky, even for the CP11’s, no matter how small your fingers are. However, with a little bit of tenacity and a lot of elbow grease, installing these cables was a walk in the park by comparison. It’s a pretty clean look and the little SATA cables are so much easier to manage in both flexibility and organization. After: Not only was there a lot more room but also a lot less stress being placed on the SATA connectors, the SATA cables, and also the PSU cables. Before: Less than ideal but still doable if you have the patience. The packaging is sufficient. Everything was secure and there was no damage to report. 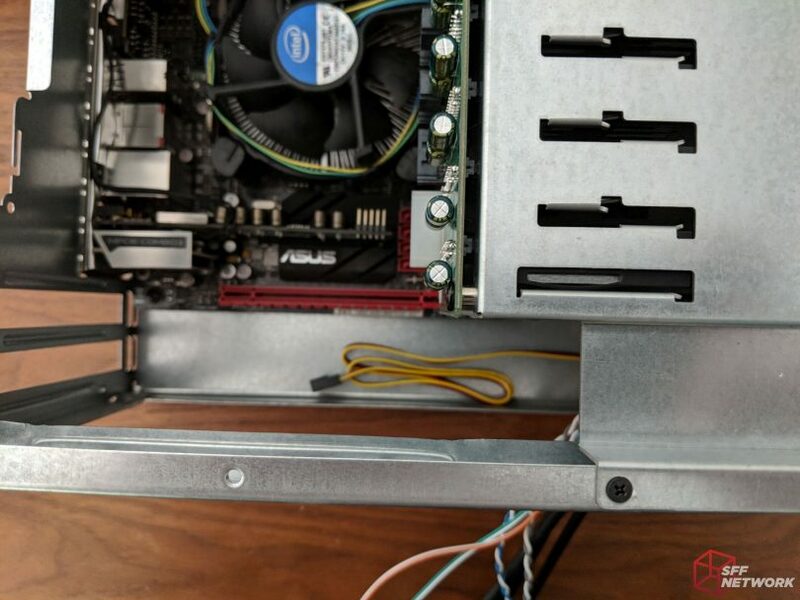 Always happy to see a case that supports SFX PSU and kicks ATX to the curb. ITX NAS! I wish we had more of these on the market. Some competition would be nice. The front door hinges are easy to access and lube if necessary -no sqeaking. 2x Ball bearing Fans (not sleeve bearing). 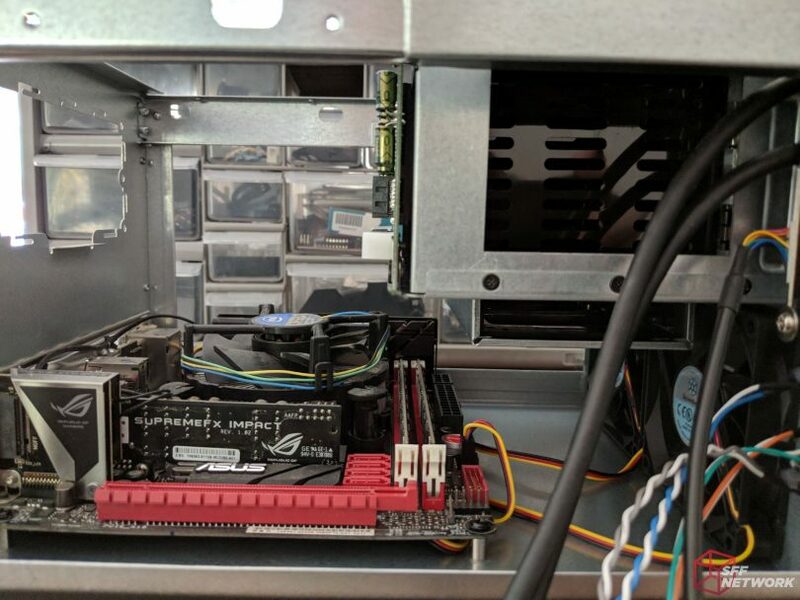 The functionality of the hot-swap bays are very smooth and not janky. They don’t feel cheap at all. The brushed aluminum face looks and feels premium. Great airflow to the internal components thanks to two well placed 80mm fans and a large intake vent. 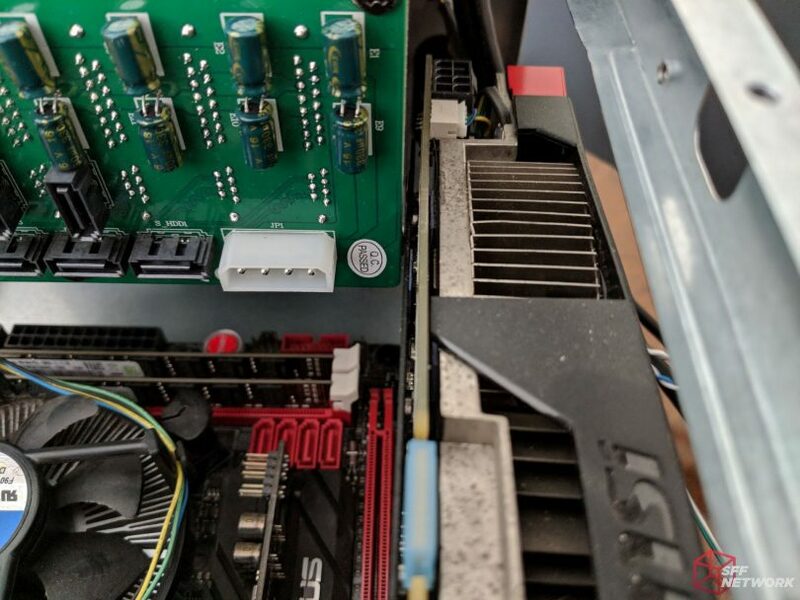 A tool-less dust filter is included for the fans. The included key is an extra layer of security. As always, the paper stock used for SilverStone’s manual goes way beyond the competition. Standard SATA cable insertion is extremely difficult and requires at least 2x 90-degree cables. If the case included CP11 Sata cables (which it should), it would likely be ~$50 more. The metal used for the chassis is extremely thin. Prone to warping and bending. Since it doesn’t support dedicated graphics, the case could have been much smaller. 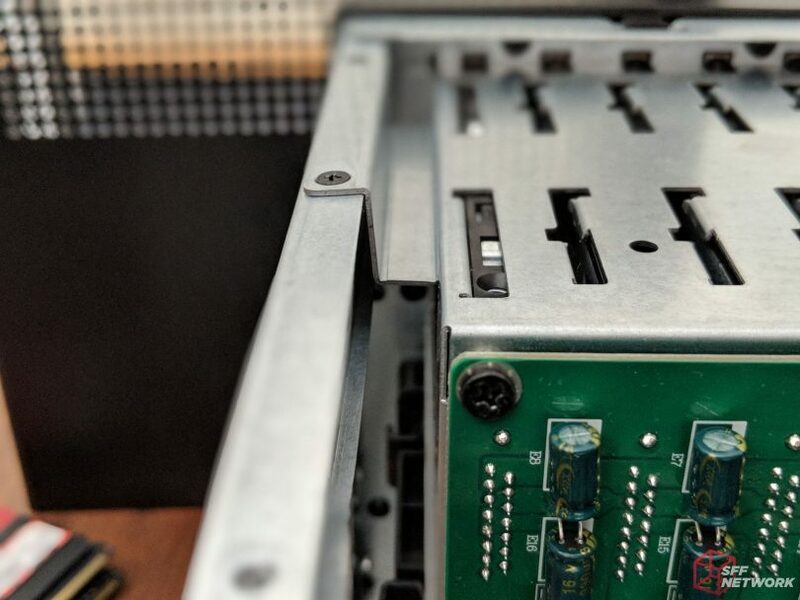 Reuse of off-the-shelf chassis shows in several compromises that where made. Mechanical HDDs won’t get much airflow, especially bays 4 and 5. SSDs are highly recommended. No support for dedicated graphics. If the hot swap bay was mounted to the far left side, it could have supported dedicated graphics. Use standard height ram modules or LP if you’re still on DDR3. 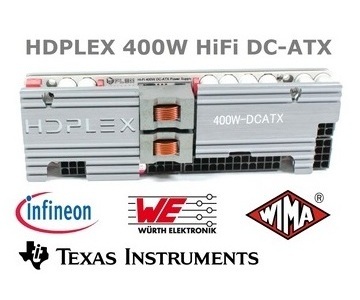 Highly recommended for an APU-based processor like the 2200g/2400g. SSDs are highly recommended over mechanical drives due to airflow. If I am to be perfectly honest with all of you. I was a little disappointed to discover that the SilverStone CS280 doesn’t support dedicated graphics cards. 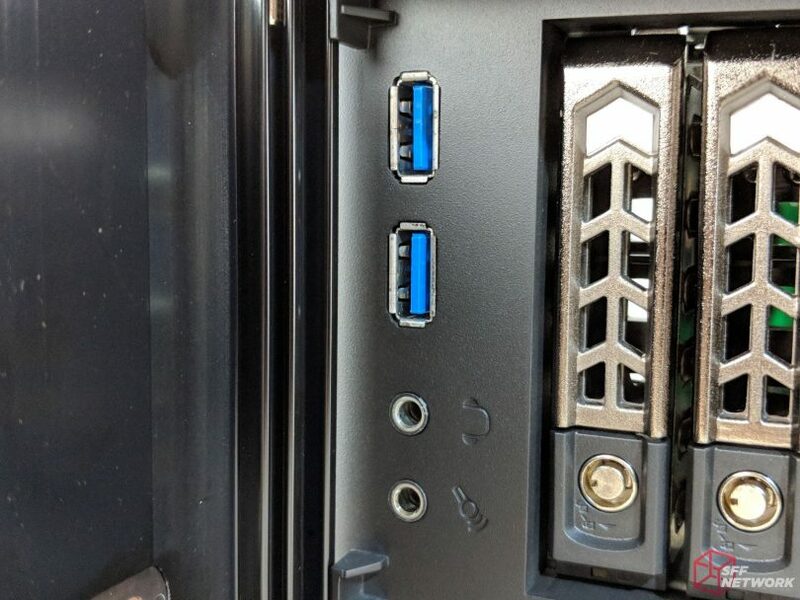 As a NAS user, if this case had supported a dedicated GPU for improved transcoding times, it would have been catapulted to the front of my list. As a result of this omission, I want to give the case a hard pass in the hopes that they will release a much improved version in the future. However, I feel like I am being a little harsh here. 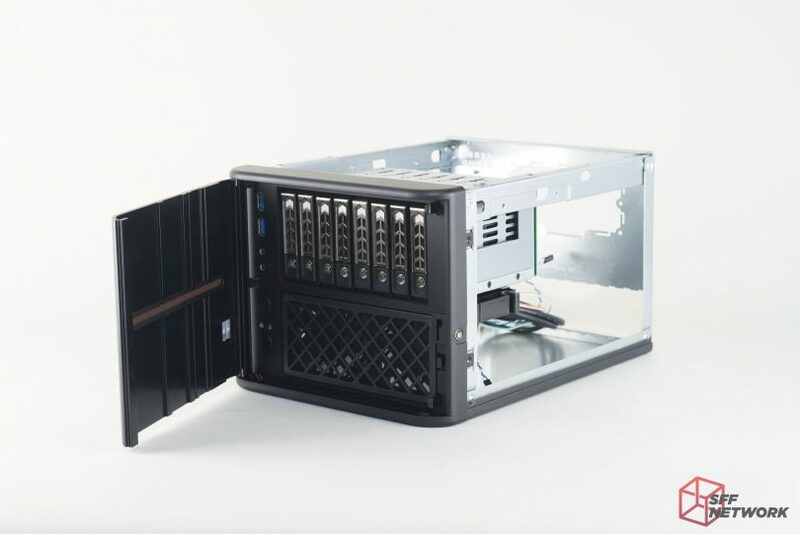 Overall, this is a pretty terrific NAS chassis especially at a price of just $180. 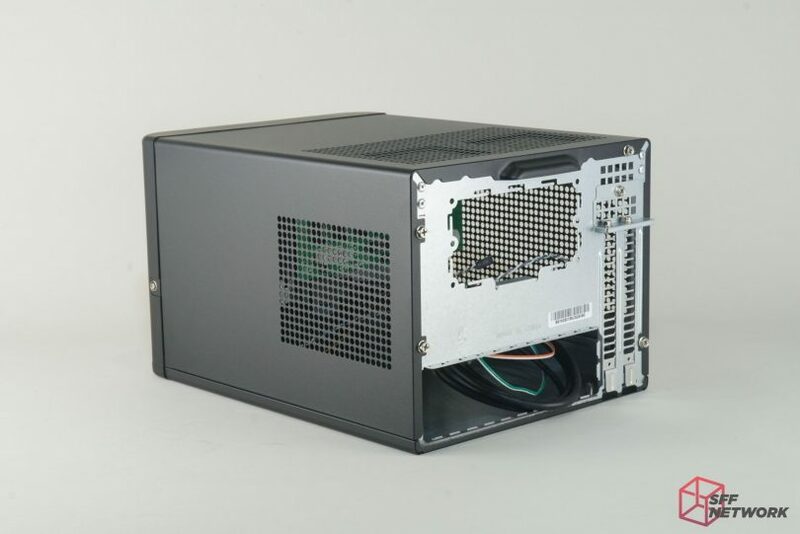 For all the flexibility this chassis provides, it’s perfect for anyone interested in building an AMD 2200G/2400G-based HTPC/NAS. 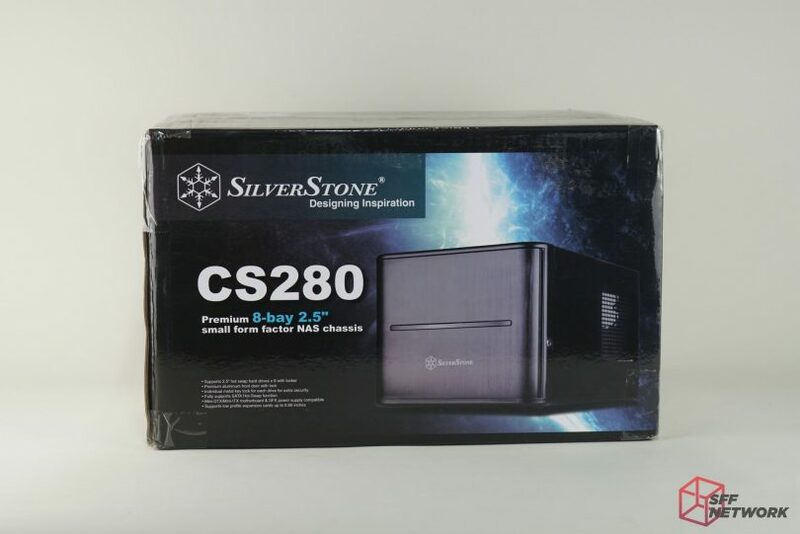 At just 11.8 liters, there is still plenty of room for improvement but without the cost eclipsing $200, the CS280 is a pretty stellar entrance into the HTPC/NAS market, without any competition to speak of. Thoughts? Please share them on the forums here and be sure to thank @Silverstone for making these products for our community.